The western side of Portland is the less favourable for walkers when compared to the eastern side. There are no cliff paths down to the shoreline; no wild goats; no hidden coves or ruined churches. 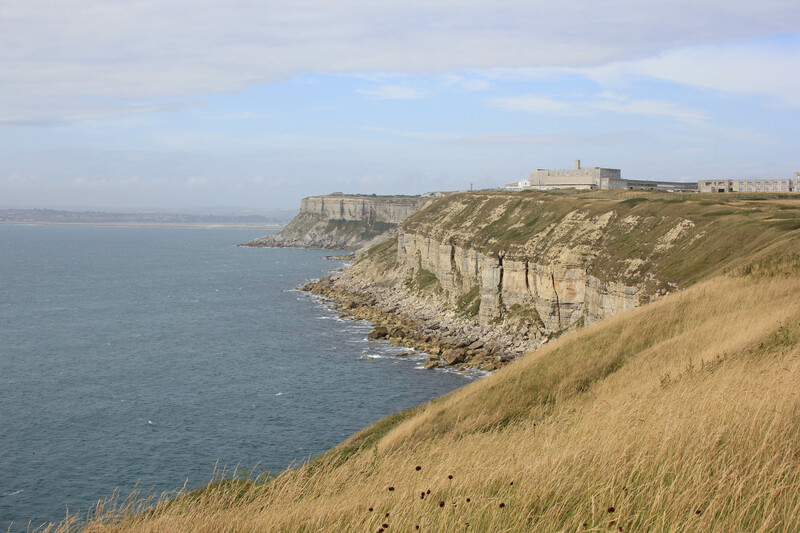 The western side is a clifftop walk passing some bleak looking concrete buildings and, for the most part, not much else. 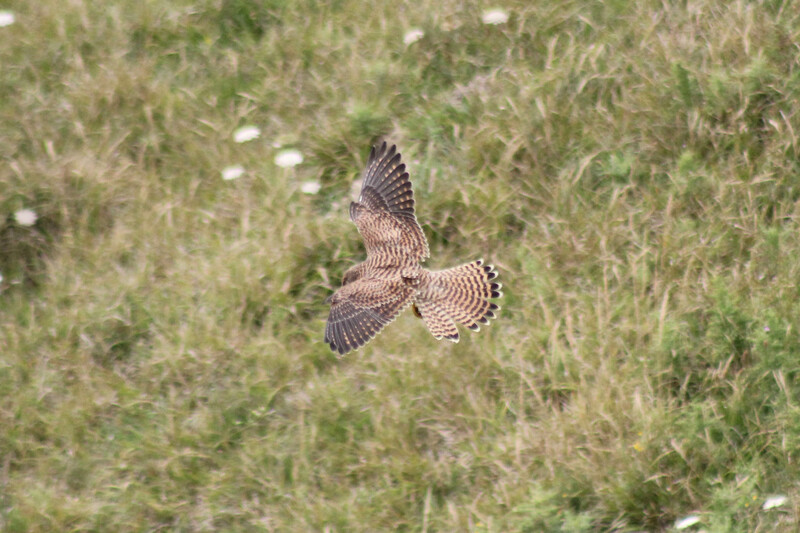 Whilst the western coastline of the island does not have the interest of the eastern side, it was here that we were lucky enough to see something that I had never seen before – a pair of hunting kestrels. 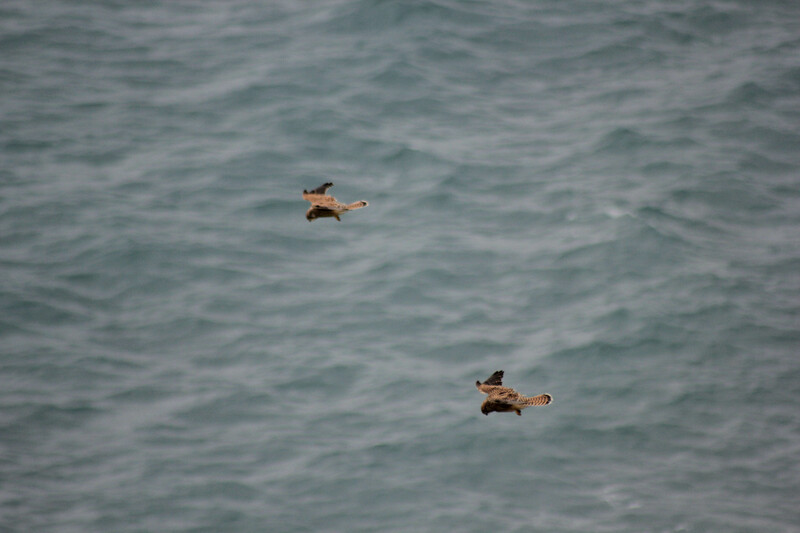 When I spotted them they were some distance away. 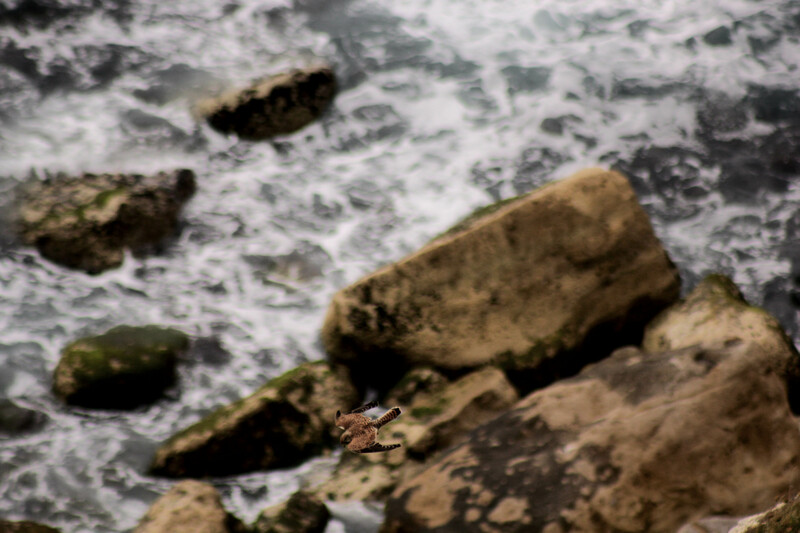 I fixed my zoom lens on my camera and took a number of pictures, but even the best was fuzzy and disappointing. 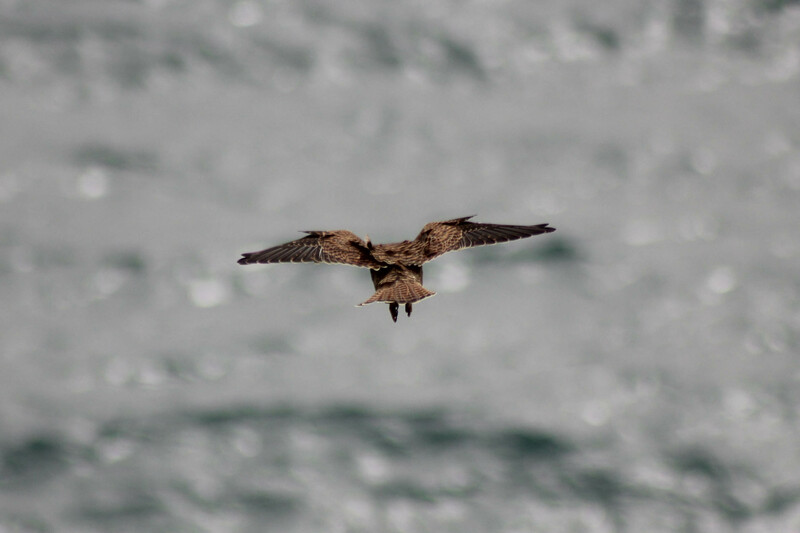 I felt sure that they would fly off before we got to them, but whilst they separated and started hunting from different spots both continued to move along the coastline in search of prey, allowing us to get close and observe. They hovered on the air currents, allowing these to take them slowly down the coastline. 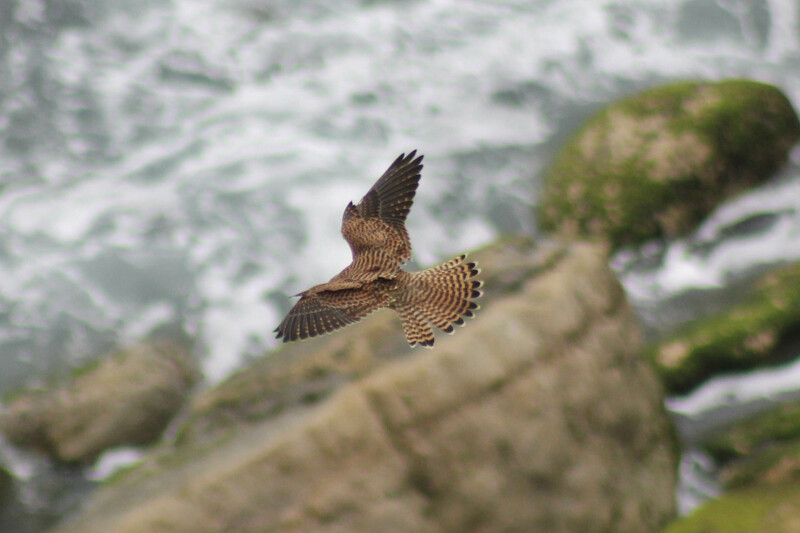 After a while they would fly back up the coast to their starting point and start the process again, ever alert for movement below which would signal prey. Then, all of a sudden, one of them dived – almost too quickly for me to react. 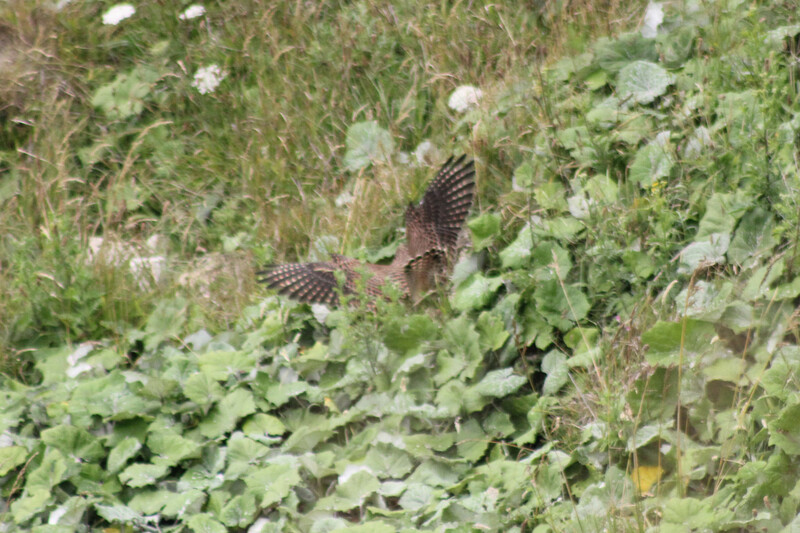 It shot down to the scrub below, where it suddenly fanned its feathers out and hovered a few feet off the ground, clearly searching for whatever had made the sudden movement that had attracted it. It suddenly veered towards a clump of plants which obviously offered more protection than the open grass. It hovered again and then pounced into the thick of it. Again, it was all so quick I hardly had time to react. Had it caught anything? I was unsure; it was shielded from view by the greenery. It stayed there for a few moments and then flew out again, returning to the higher ground to begin its patrol once more. When you arrive, the mosaic gives it away. The Falls of Shin, in the middle of the Scottish Highlands, are a fantastic place to watch salmon trying to pass up river during the summer months. About five miles north of the falls is Loch Shin, a large body of water some 16 miles long and covering an area of over 30 square miles. The entirety of this loch discharges at a single point, at its southernmost extreme, into the River Shin. In terms of water dispensed, it is said that the River Shin is the largest in Sutherland. It drops some 300 feet during its short 7-mile journey to the Kyle of Sutherland estuary before it flows out to sea at the Dornoch Firth. Most of the river’s descent is in the last mile or so. At the Falls of Shin the river narrows to a few metres in width. 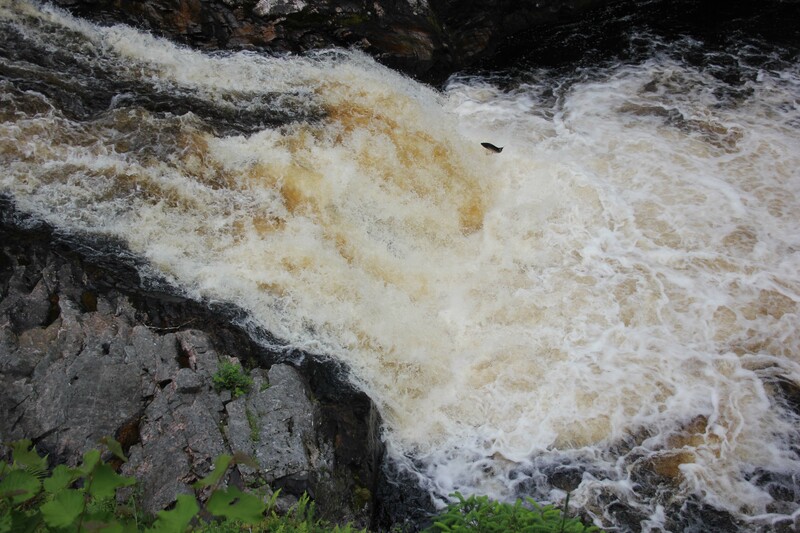 It is here where wild Atlantic salmon can be seen leaping out of the water as they try to fight their way upstream to the safety of the Loch and feeder rivers to spawn. I wasn’t sure what we would see when we arrived here, so all I told my wife and children was that we were here to see a waterfall. 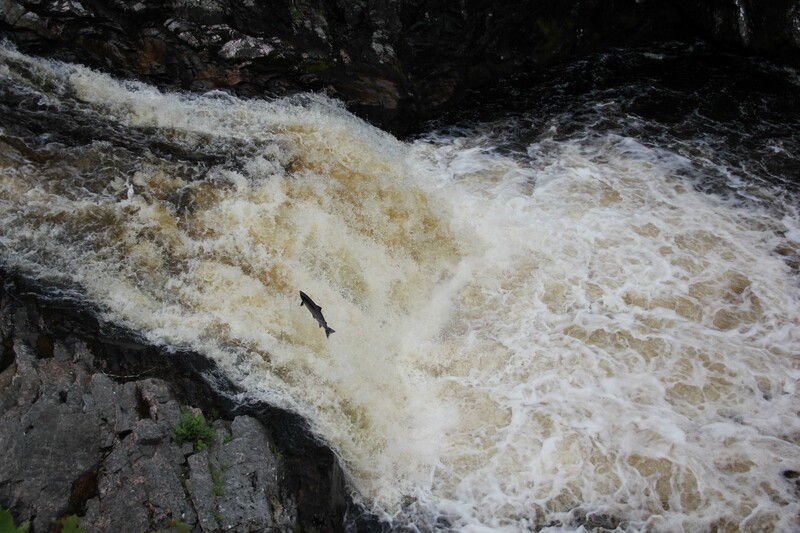 However, within seconds of our arrival there were the salmon, leaping to the very extent of their ability against a torrent of water which looked to slam them back down to their starting place. 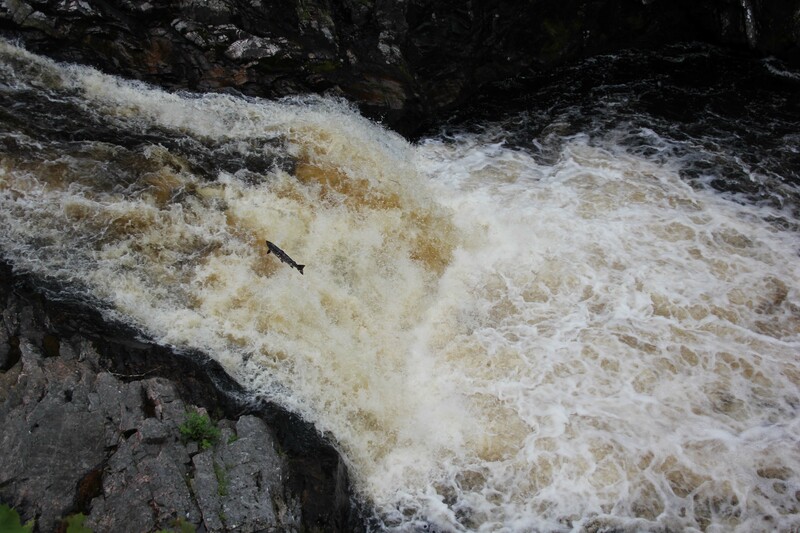 The salmon in the picture above, I am sure, didn’t make it – it’s angle of attack seemed wrong. However, within seconds another one leaped from the churning, seething waters to make its bid. We watched as every few seconds salmon threw themselves upward, out of the resistance of the river into a split second of free air before diving back into the force of the waters. 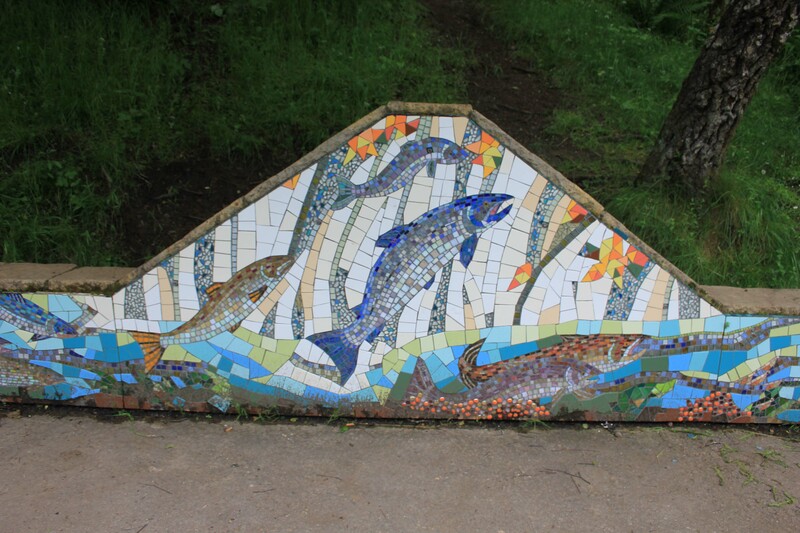 It seemed impossible that any of the fish actually made the leap up the falls, but clearly they do. 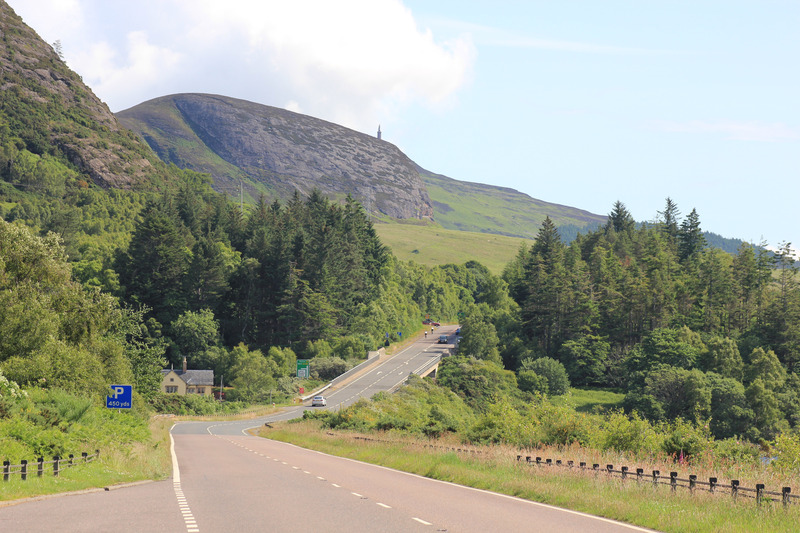 About 35 miles north of Inverness the Sutherland Monument stands on the summit of Beinn a’ Bhragaidh, a small hill of 1,302 feet overlooking the village of Golspie. It sticks out of the hill like a needle and can be seen from many miles away. 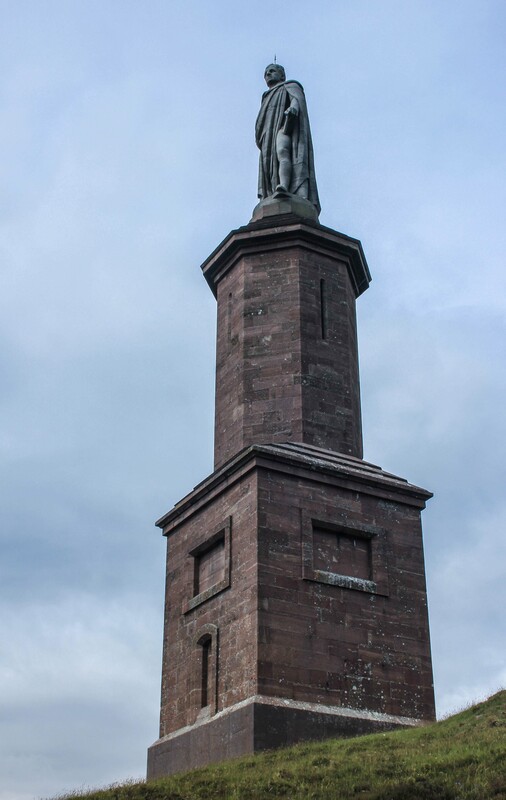 The Sutherland Monument was erected in the 1830’s, following the death of the first Duke of Sutherland. He was given the title about six months before he died. 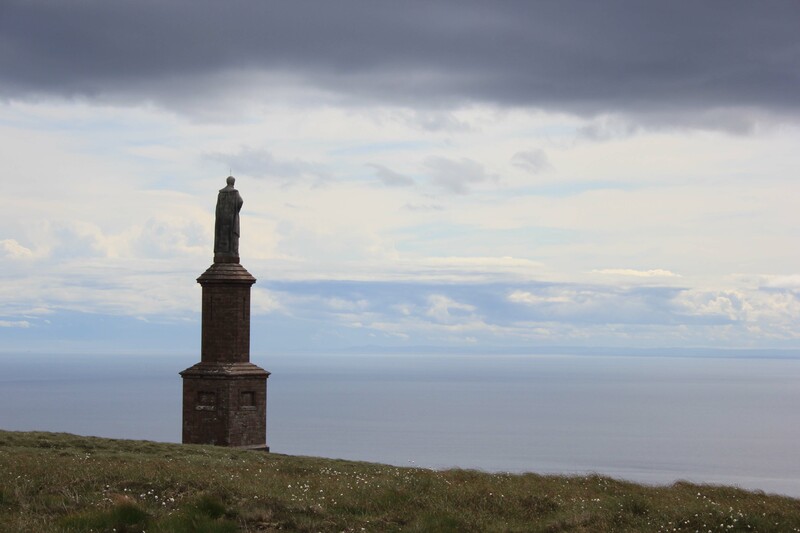 It is a controversial memorial, for the Duke of Sutherland and his wife are largely reviled for their part in the Highland Clearances. At the time of the clearances, he was a Marquis, former MP and ambassador. By the time he married the wealthy Elizabeth, Countess of Sutherland, he was already a millionaire in his own right, said to be earning some £300,000 per annum from his estates in Staffordshire. The Sutherland estate was one of the largest estates in Europe, if not the largest, although it was viewed as uneconomic when considered in its own right. For this reason, during the years 1811-21 the Countess and her husband evicted their farming tenants and residents, demolishing their homes and clearing the land. The land was then let more profitably to Lowland sheep farmers. Many of those evicted resettled in new villages along the coast. Many emigrated overseas to the “New World”. However, the fact was that families who had lived on this land for many generations were simply turfed out at short notice. According to some, the duke was horrified by the appalling living conditions the people endured on the inland part of the estate, and believed the land could simply not sustain them. They argue he moved them to what he considered to be better conditions and a better life. 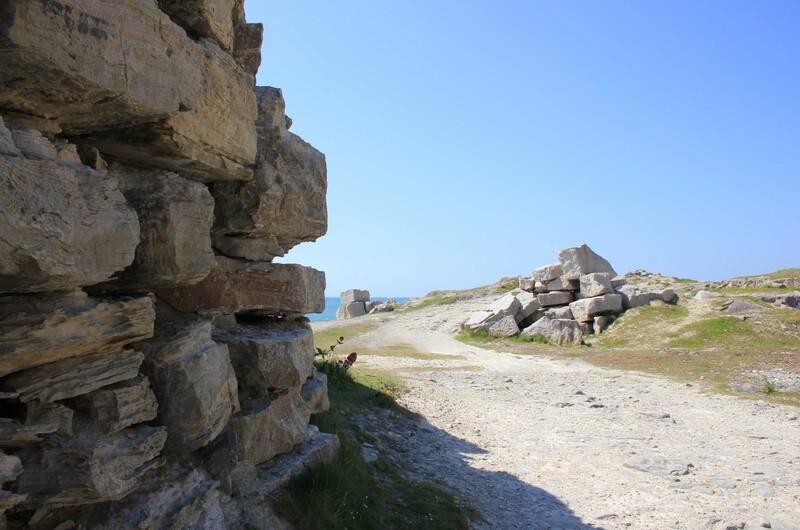 According to others, the clearances were simply driven by greed. There was more profit to be had from sheep farming. As for the existing families, they simply had to be moved. The Highland Clearances were not confined to the Sutherland estate; they occurred all across the Scottish Highlands. However, the Sutherland clearances are considered to be the most dramatic and harsh. Large volumes of people were resettled in a relatively short period of time, and without compassion. In some cases crops had to be left in the ground and the families had to carry what they could, leaving everything else behind. Estate records show that the eviction of 2,000 families a day was not uncommon. 1814 was a notorious year, known as the Year of the Burning. Once families had been evicted, their houses were burnt down, sometimes with their belongings still in them. On one occasion a witness reported seeing 250 crofts on fire from a single vantage point. Today the stone outlines of demolished ruins can still be seen. The Countess and her husband themselves were resident in London, and so employed a “factor” (from the Latin “who acts”) to represent them. This factor was Patrick Sellar, himself a sheep farmer. He oversaw many of the evictions. One of these was in Strathnaver, on the north coast, and concerned the home of William Chisholm who lived with his wife and mother-in-law, Margaret MacKay. Margaret MacKay was over 90 years old and refused to leave during the eviction. The roof was therefore set on fire with her inside the building, reportedly on the basis that this would probably persuade her to leave. Margaret MacKay was rescued by her daughter and taken to a nearby shed which itself was only just avoided being torched. Margaret MacKay died five days later. Sellar was put on trial for arson and culpable homicide. The jury were said to be local landowners. The witnesses for the prosecution only spoke Gaelic which had to be translated for the jury to understand the evidence. Sellar was acquitted and was later given large tracts of land by the Countess and her husband, in thanks for his work for them. 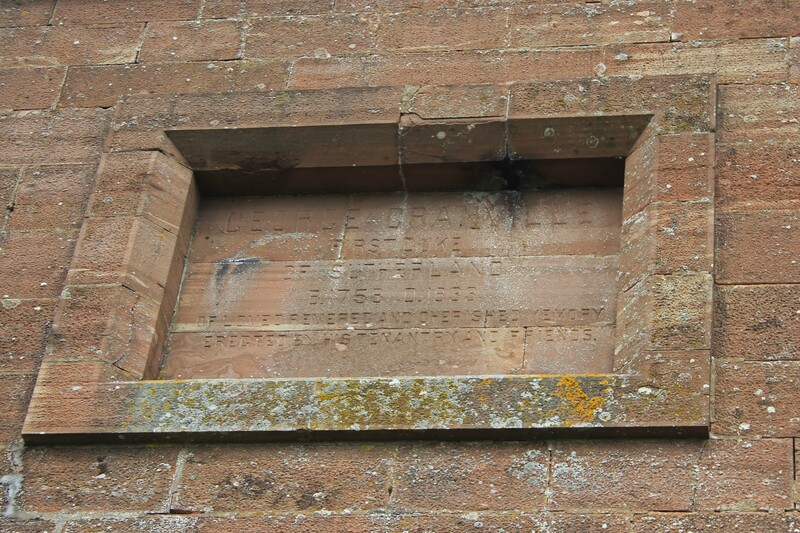 When the Duke of Sutherland died in 1833 a subscription was started to raise funds for a monument in his memory. According to Discover Sutherland, “Subscriptions came in from far and wide, which is surprising given his reputation today“. The monument was erected in 1837 and stands at 100 feet tall. It was carried up Beinn a’ Bhragaidh by horse and cart. Its inscription reads, “Of loved, revered and cherished memory. Erected by his tenantry and friends“. Known locally as The Mannie, opinion on it seems to be divided into two camps. Some want the monument to stay, as a reminder of what happened here. One local resident has said, “If you take away history nobody will ask questions. If he stays there people will ask what it is and then hear what happened here during the Highland Clearances“. Others, however, want the monument pulled down, calling it a “…monument to a monster“. There have been petitions to the Scottish Parliament to have it removed. There have been hate messages sprayed across its base. In 1994 there was even an attempt to dynamite it. 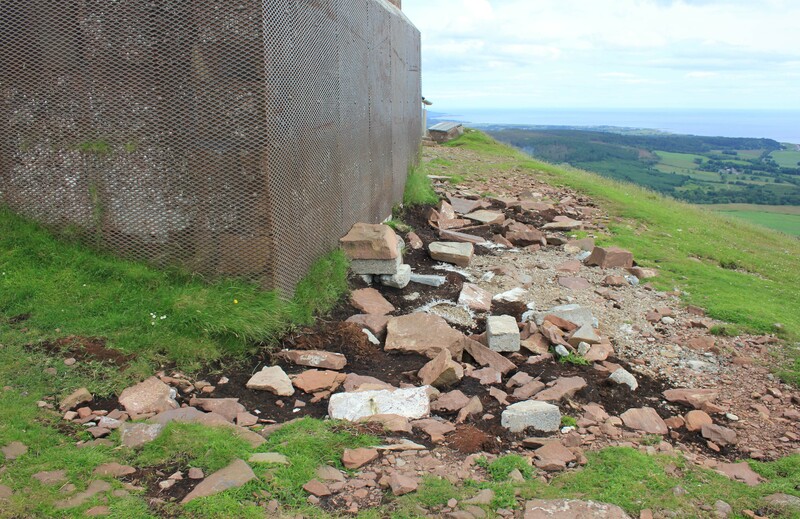 There are regular reports of damage and vandalism to the monument, as people attempt to topple it. When we reached it the base had been protected by a metal cage, and there was a small amount of rubble lying around the base. Was this evidence of someone chiseling away at the base? 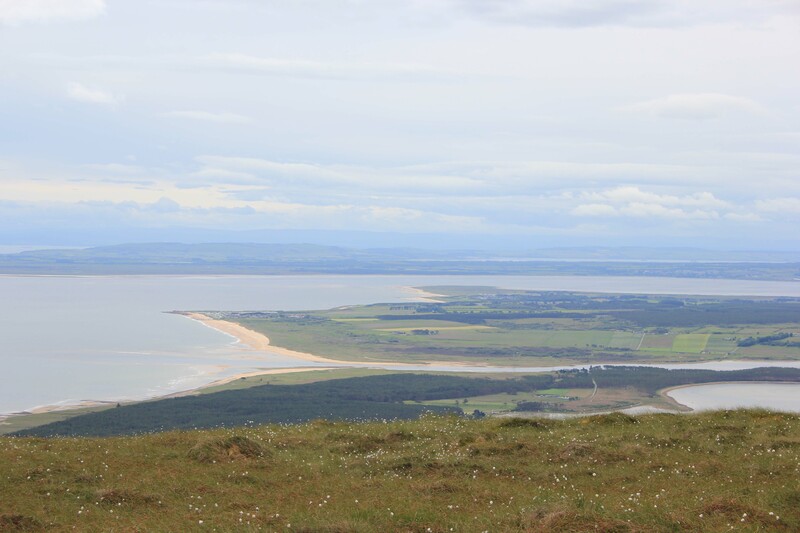 As it is, the Duke of Sutherland currently remains in situ, surveying Golspie and the coastline beyond. It is a wonderful stretch of coastline. We’ll be walking through one day. As Coastal Walkers, we wanted our July 2015 trip to Scotland to take in some of the country’s amazing coastline. 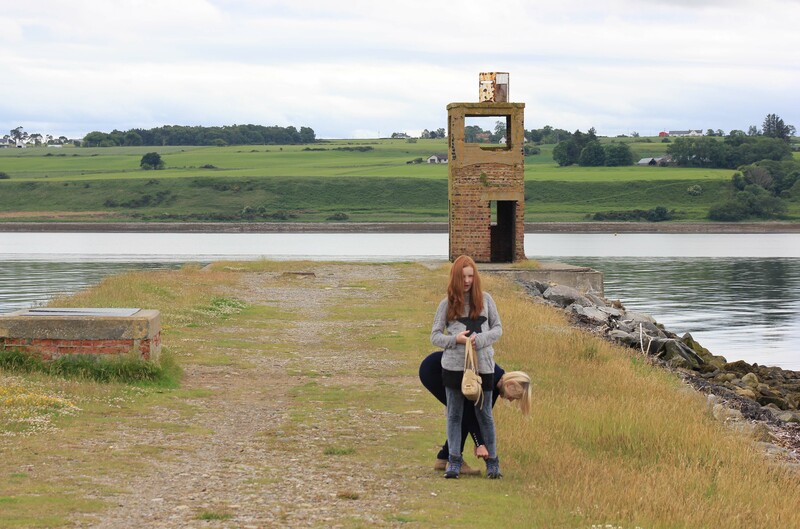 Our first stop was at the Cromarty Firth, about 15 miles to the north of Inverness. Not only could we visit the distiller of my wife’s favourite whisky, Dalmore, but we could also show the kids the spectacular site of the oil rigs, laid up in the water for repair. The Cromarty Firth is a generous body of protected water and in times past provided an important trade link with the south. In World War I the American Navy took over Dalmore Distillery and used it as a submarine mine base. In 1917-19 they built a pier sticking out into the firth, still known locally as “Yankee Pier”. The pier is on distillery land and today is accessible to all. It affords great views and is worth the short walk. In the 1930’s flying boat crews were here and the base was used for training and surveillance, stepping up to active duties during World War II as the battle for air supremacy raged across Europe. 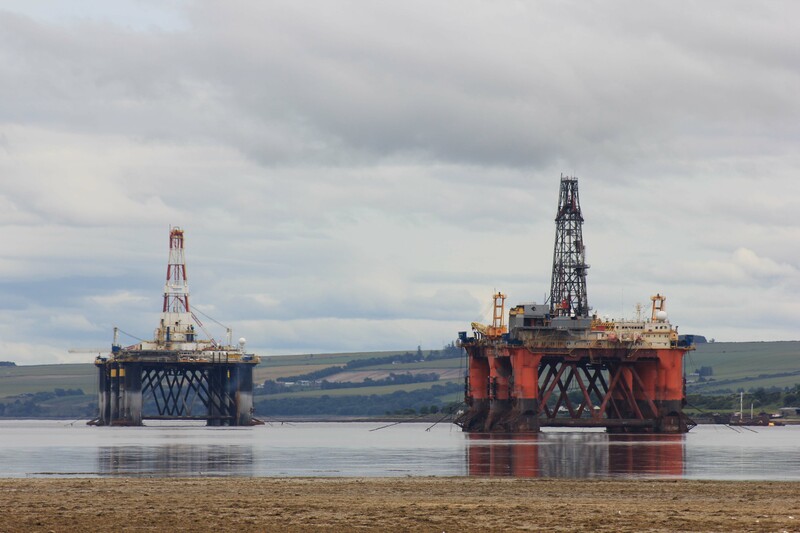 Today the military base is gone and the Cromarty Firth is used primarily by the oil industry. There were more oil rigs this time than I had seen in times past – you can see them all stacking up in the first photo. Why were there so many here on this trip? Were they all in for repair? Alas, no. 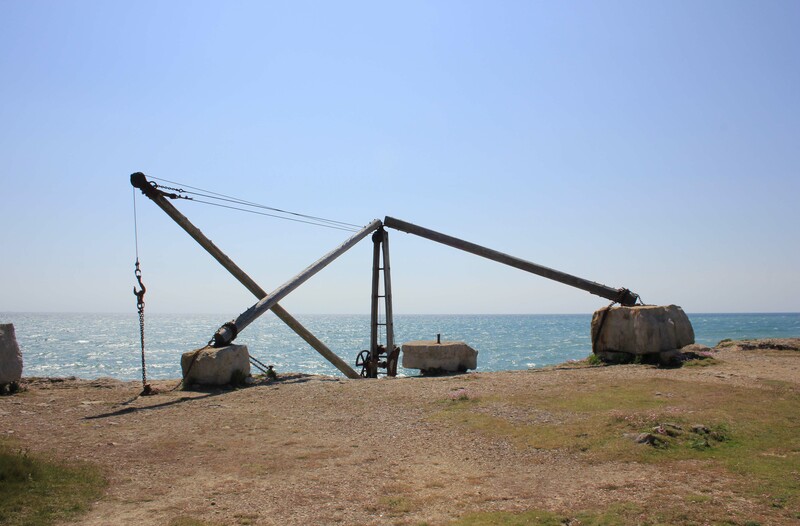 Whilst some rigs were here for repair or refit, a number were simply “parked” here. 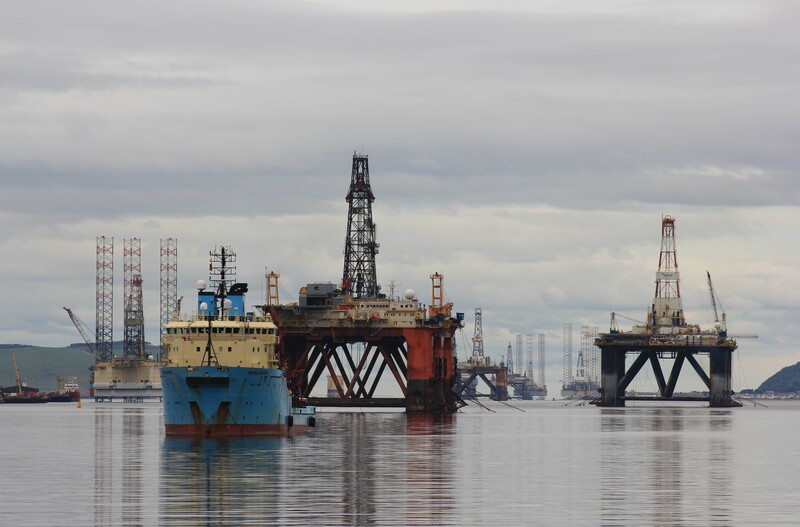 The persistent depression in oil prices had caused uncertainty in the oil industry, resulting in a considerable drop in demand for North Sea oil and gas exploration. By October 2015 there were 12 rigs here, with further capacity for a further 6 or so. We could see them held fast with enormous chains. I’ve not been back to the Cromarty Firth since. I wonder how many are laid up there today? 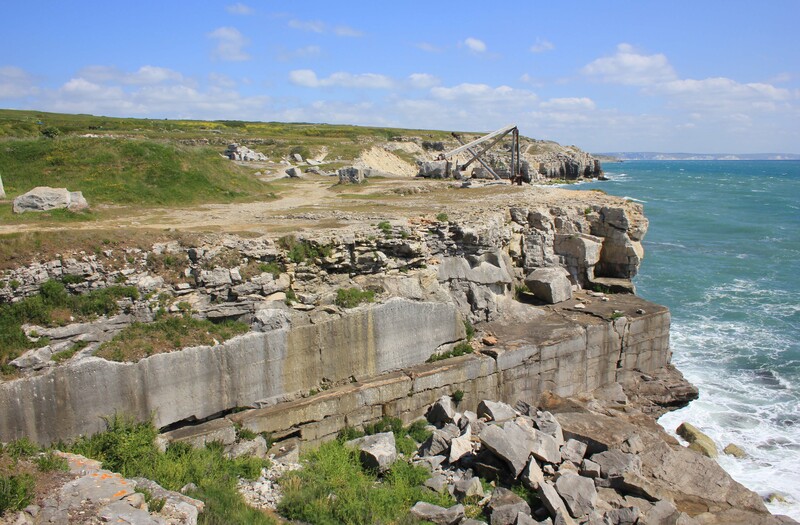 As we made our final approach to Portland Bill we left the rugged, almost Mediterranean, landscape behind and entered quarry territory. Massive piles of rocks lay heaped on the ground, as if giants had passed this way and made cairns the size of small houses. Piles of rubble lay strewn around. In some places these rocks lay across the entrances to great sunken pits, cut into the ground. It seemed as if there may be a maze of caves inside, and that the rocks had been used to block up the entrances in order to stop anyone exploring. At one point we came across a hoist which appeared to be used for moving rocks up from a platform cut into the cliffs below. It didn’t look very “modern” and I was left wondering if it was a mock-up of a centuries-old crane. Bur maybe not; perhaps the old ways are the best. And then we were out of the barren landscape and back to civilisation. Portland’s three lighthouses stretched in a line in front of us. 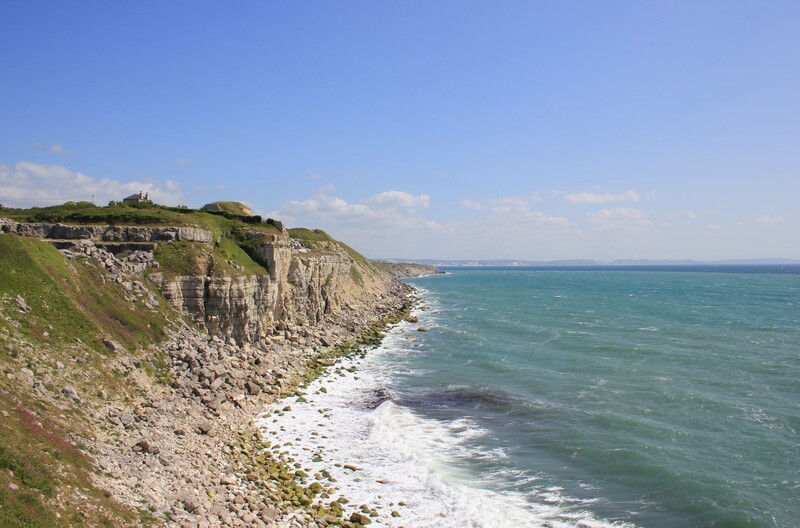 A few hundred years ago the Portland area was well known for shipwrecks, both off Portland itself and around Chesil Beach to the north. After a series of petitions to Trinity House, a decision was made in the eighteenth century to build two lighthouses here. These, known as the Old Higher Lighthouse and the Old Lower Lighthouse, were built at the same time. 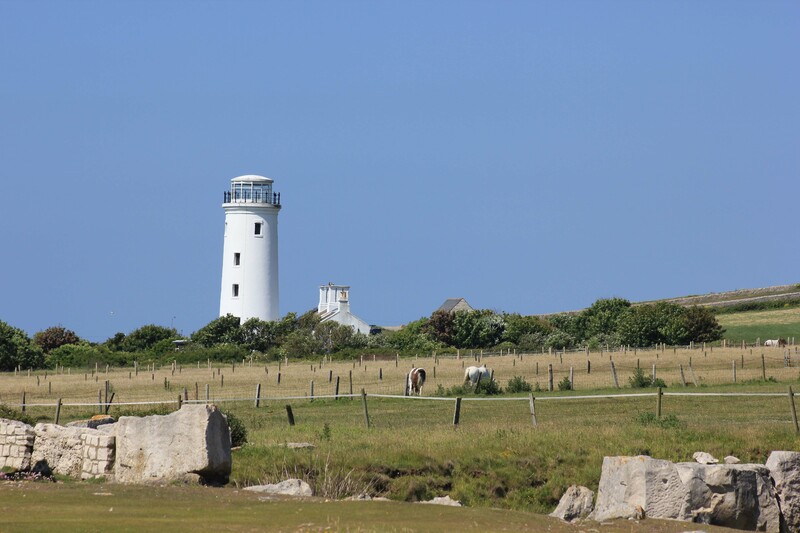 The Old Higher Lighthouse is situated, as its name suggests, slightly further inland on higher ground. The Old Lower Lighthouse is lower down, closer to the coast. Both lighthouses shone for the first time on 29 September 1716. They lasted for nearly 200 years, but were eventually replaced. 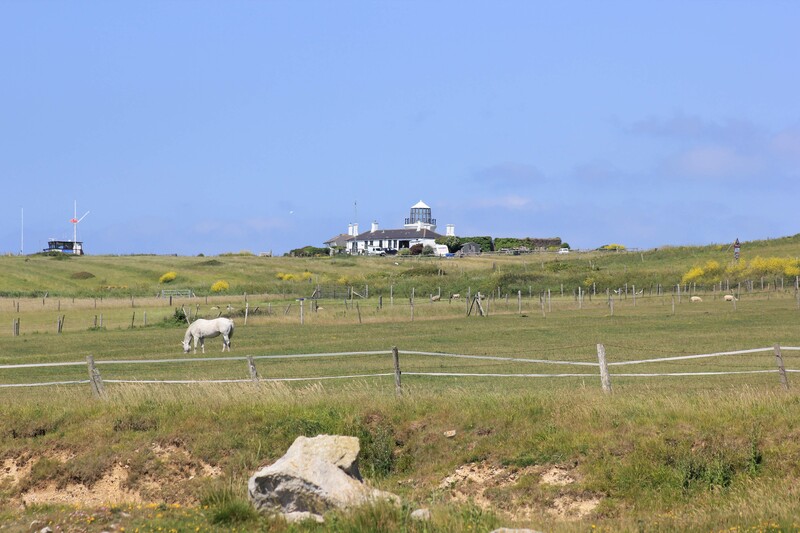 The Old Higher Lighthouse is now privately owned accommodation and the Old Lower Lighthouse a bird observatory. 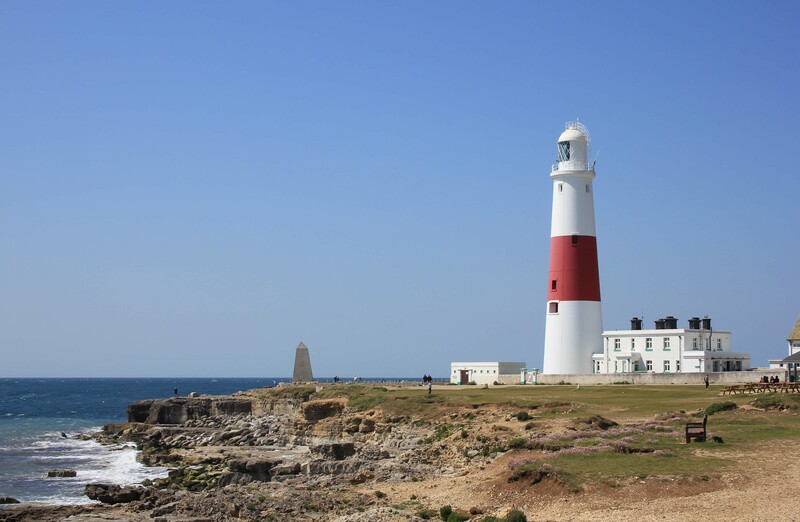 In the very early 1900’s Trinity House put forward plans to replace both existing lighthouses with a single, taller, lighthouse at Portland Bill Point. Work started in 1903, and the new lighthouse lit its first lamp on 11 January 1906. It stands at 135 feet and remains a functioning lighthouse; it is now fully automated. Just in front of the lighthouse is an obelisk. 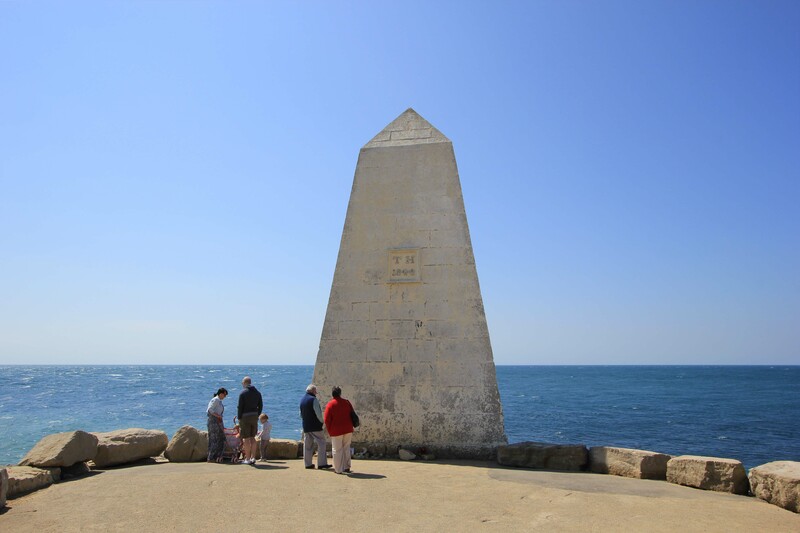 Although it looks like a memorial (and seems to be used as such by some, as there were flowers and photos around its base when we visited) it is in fact a daymark. These are navigational aids to shipping which are used in the daytime, as opposed to lighthouses which are predominantly used at night or in poor weather. 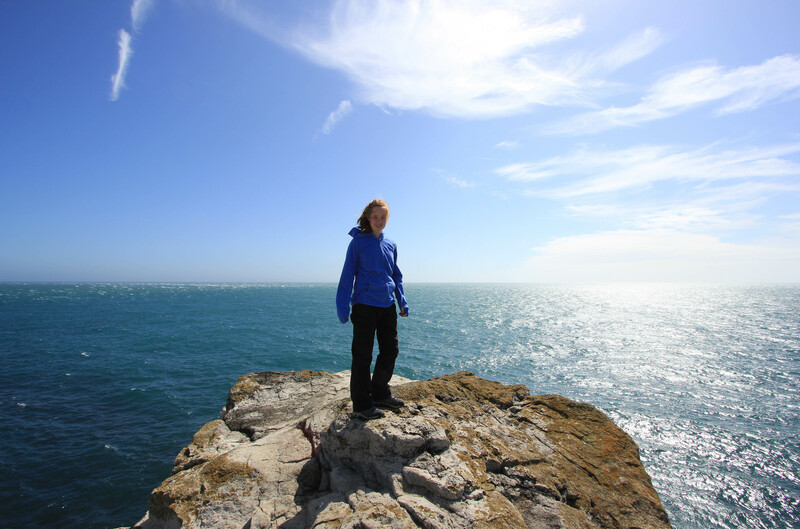 As we walked south from Church Ope Cove I felt that the landscape was almost Mediterranean. We were completely alone. 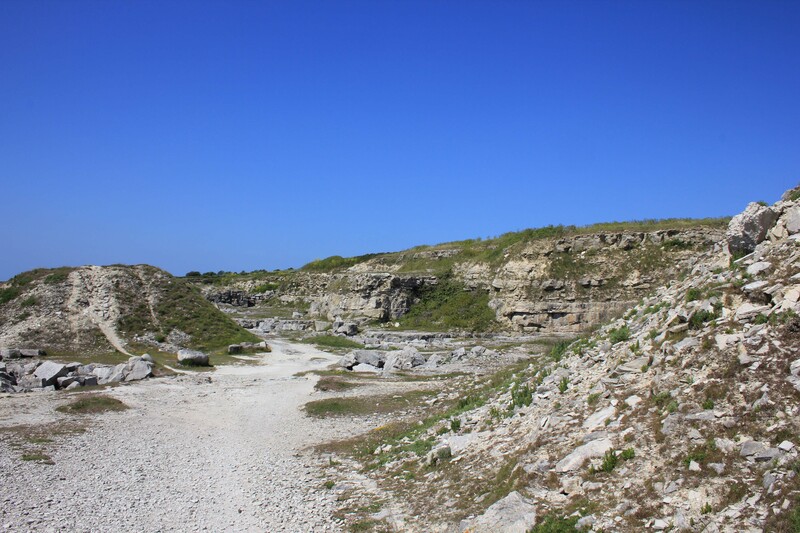 The sky was a blistering blue and glared off the limestone cliffs. The sea rippled in an inviting turquoise colour rather than in the steely green-grey I often see off England’s shores. 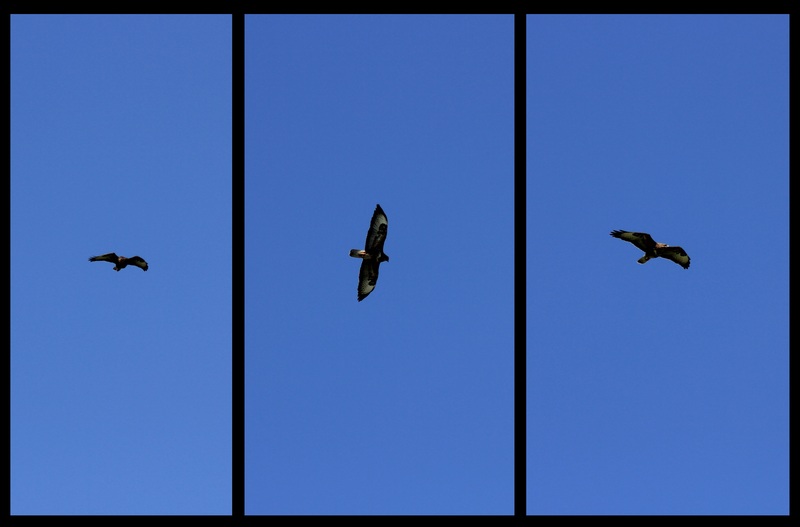 Overhead, a young buzzard hovered as it hunted. We watched it for a long time. It seemed to follow us as we went. Were we disturbing its prey as we crunched our way along the path? Or maybe it was hunting us! The Coastal Path south of Church Ope Cove is a solitary, beautiful stretch of coastline that I would recommend to anyone. 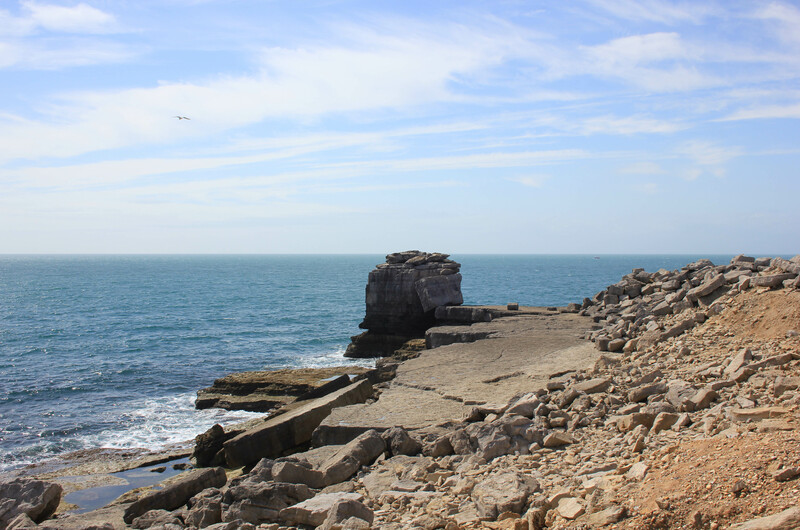 After so many quarries, prisons and immigration centres to the north side of Portland it was a pleasure to get back to a stretch of rugged coastline. Except the ruggedness still had a structured look to it. None of Portland is untouched. Its stone has been lost to too many construction projects. 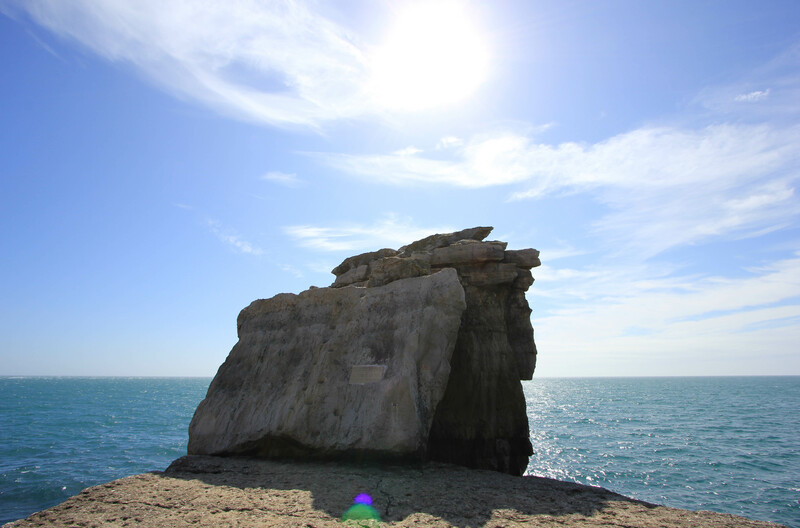 Every cliff face had a blocky look to it, showing where the stone had been cut from its face. We weren’t quite walking in a Minecraft game but the comparison springs to mind. Indeed, we soon reached reminders of Portland’s contribution to the urban landscape of so many cities across the world. 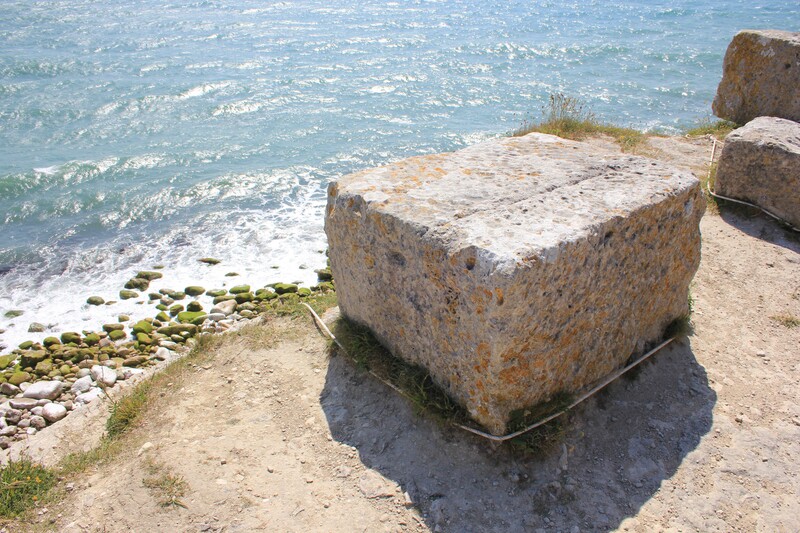 Massive stone blocks had been set at the side of the path. But these had not been discarded. They a purpose – they had some ropes looped around them. Why where there ropes looped around these blocks? 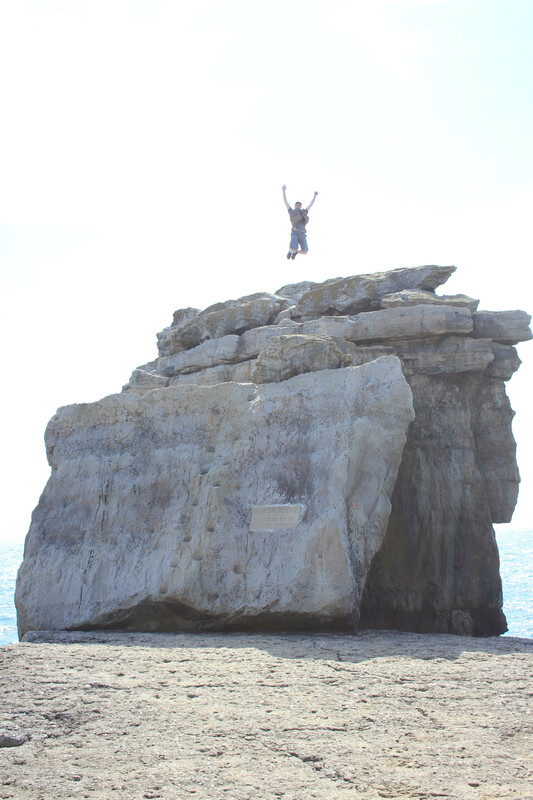 I leaned over the cliff edge and peered down – ah! 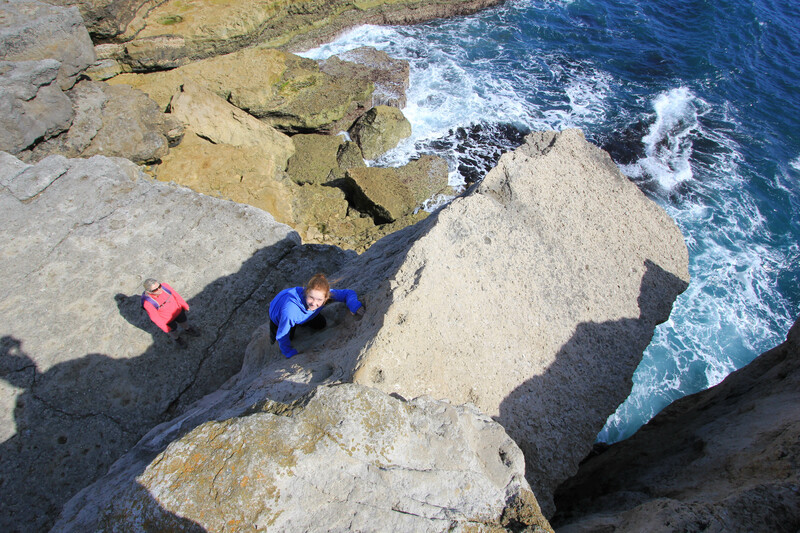 A climbing lesson – Portland is a much sought-out climbing destination. 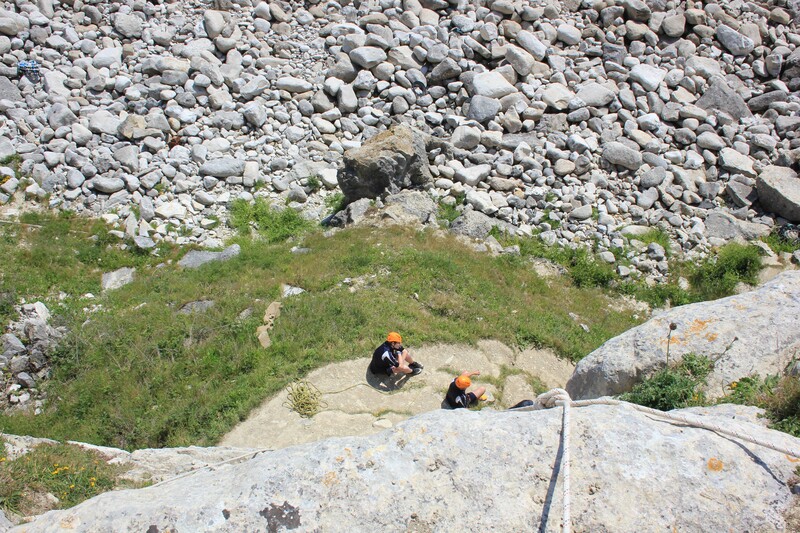 The students were all sat around a climbing instructor who was running through the order of the day, which was clearly for the students to take the strain of the rope and climb up to the plateau above. With us at the top. Or perhaps other people who would come along after we left. Other, more sinister, people who could easily snip the rope when these climbers were only half way up, were they so inclined to do so.